John is invited to “Come up” into that throne room (Revelation 4:1) and advised that he would be shown future events (contextually anticipated in Revelation 6–8:1). He immediately goes into vision and is given glimpses of the “players” that will be on stage in the rest of the book. A throne was placed in heaven (4:2), suggesting the commencement of an event. “One” sat on that throne (God the Father) (4:3). On 24 thrones surrounding His (4:4) throne were 24 redeemed “elders” (5:9). Four living “beasts” (creatures) were in the middle and around the throne (4:6). When they fall down and worship God, the 24 elders join in adulation to Him (4:9-11). The throne is the “source” of lightnings, thunders and voices, suggesting a judicial scene (4:5). God’s right hand is seen holding a sealed book (while He is seated on the throne) (5:1). Some legal process has just been completed. Jesus, the Lion and the Lamb, is deemed worthy to open the seals, suggesting judicial merit. Then He takes it from God the Father’s hand (5:7). With the choirs of heaven and then the universe singing praises to those divine beings (5:9-14), anticipation of the seal removal brings acclamation. The final stages of redemptive history commences with the breaking of the first seal. That anthem of praise occurs because some documentation at God’s throne was concluded, then sealed. The anticipated breaking of each seal would then move the time closer when the final vindication of God’s judgments occurs. The evidence is strong that a judicial act is concluded on the throne with its outcome recorded in the seven-sealed scroll. A major transition in time is about to arrive heralded by the choir singing! With the breaking of the first seal, time will no longer be delayed (Revelation 10:6). “ Also in front of the throne there was what looked like a sea of glass, clear as crystal. In the center, around the throne, were four living creatures, and they were covered with eyes, in front and in back…. Each of the four living creatures had six wings and was covered with eyes all around, even under its wings. Day and night they never stop saying: ‘Holy, holy, holy is the Lord God Almighty,’ who was, and is, and is to come” (Revelation 4:6, 8). The sea of glass appears to be the massive “floor” of God’s heavenly throne (cf. Exodus 24:10). This is where the redeemed will stand when singing the song of Moses and the Lamb (Revelation 15:2-4). It is “crystal clear,” related to “crystal-clear jasper” (Revelation 21:11), “gold like pure glass” (21:18) and the “crystal-clear river of the water of life” (22:1). That “sea of glass” represents God’s “transcendent holiness.” That is the foundation of His throne. There are four “living beings” noted before the throne and in the midst of the throne. In 5:6 the Lamb is depicted as in the center of the throne. Most expositors believe that all this imagery suggests the immediate vicinity of the throne. These four beings appear as symbolic “beasts” or “creatures.” The context claims them as celestial beings directly associated with God’s throne. Some also see these, based on Ezekiel 1:5-21, 10:1, as “spaced” around the throne in constant motion. These “living beings” are filled with eyes in front and behind, contextually acting a part in God’s judicial perceptions. They help oversee God’s affairs as His “agents.” Shortly they will be acting a role after the opening of the first four seals. “Four” suggests universality – a complete representation. The eyes suggest judicial understanding, identifying with God’s eternal decisions. The six wings relate to the seraphim of Isaiah (6:2), who represented a part in man’s purification, being a medium between the sanctuary altar of incense and man. “And the first beast was like a lion, and the second beast like a calf, and the third beast had a face as a man, and the fourth beast was like a flying eagle” (Revelation 4:7). Curiously, these symbols parallel the standards or insignias of the four lead tribes of Israel! The tabernacle was oriented east/west, making the entrance into the courtyard from the east and the entrance into the precincts of the tabernacle the same. East represents the “direction” from which “deliverance” comes. With this background we can diagram a simple picture of these lead tribes. The alluring question: “What do those lead tribes have to do with the throne room’s living creatures? Standard thinking draws on Zechariah 6:1-8, 1:8-15, Ezekiel 14:12-23 and Leviticus 26:18-28 with the assumption that they provide a “compositional paradigm” for God’s judgments against those harming God’s people. There are problems in these views. The four “horses” in Zechariah and their “riders” are alive with vastly different symbolism and function. Finally, to review its contents (Revelation 5:2-4). The latter is an ever-present anticipatory event. It will draw redemptive history to a close. Clearly, the cry “Who is worthy?” is rhetorical – but it became an element of suspense since that “search” caused John the Revelator to weep (5:5). The “lion of the tribe of Juda,” visually identified as a Lamb, is chosen because he was victorious, an “overcomer” (nikao – G). This strengthens the inference that the scroll contains judicial verdicts that can only be reviewed by Christ (who perfectly resisted sin). There is something penetrating in this scene that suggests a legal affirmation of the recorded “decisions of the court” is being sought. Only the Lamb “as it had been slain” and is depicted as “all-knowing” is worthy to confirm/affirm the Father’s decisions! And – with His seven spirit-directed eyes, He is able to perceive the minutest details concerning God’s conclusions related to the “earth” (Revelation 5:6)! There is “classified information” in that scroll that must be revealed at the right time. Equally important, the seals cannot be opened until each horse is ready for its mission! The Lamb opens the seals at the “right time.” The living creatures direct the horses to act. The Biblical use of horses is exclusively associated with war operations (save for Isaiah 28:28). Since the “seal” vision is driven by much symbolism (i.e., a Lamb opening the seals), the horses must be figurative of a “spiritual” battle. Since the four “living creatures” directly relate to God’s throne and are associated with the opening of the first four seals, their association to the four lead tribes of Israel must have significance. We are soon to be given end-time insights between the warring sides – Christ and His people and Satan and his people. Embellishing the imagery, these horses also represent “people” in a battle or conflict (Song of Solomon 1:9, Isaiah 63:13, Zechariah 10:3). “Blow ye the trumpet in Zion, and sound an alarm in my holy mountain: let all the inhabitants of the land tremble: for the day of the LORD cometh, for it is nigh at hand; A day of darkness and of gloominess, a day of clouds and of thick darkness, as the morning spread upon the mountains: a great people and a strong; there hath not been ever the like, neither shall be any more after it, even to the years of many generations. A fire devoureth before them; and behind them a flame burneth: the land is as the garden of Eden before them, and behind them a desolate wilderness; yea, and nothing shall escape them. The appearance of them is as the appearance of horses; and as horsemen, so shall they run.” (Joel 2:1-4). The horse color symbolizes its character or identity. The welcoming “living creature” will associate the historic role of that lead tribe in ancient history to an apocalyptic meaning. I watched as the Lamb opened the first of the seven seals. Then I heard one of the four living creatures say in a voice like thunder, “Come!” (Revelation 6:1 – NIV). We know this is the “lion creature” from the sequence given (Revelation 4:7). This was the tribe of Judah to the east. Elevated promises would come through this tribe. It would be the forerunner of Christ. Jacob’s prophecy: “The sceptre shall not depart from Judah, nor a lawgiver from between his feet, until Shiloh come; and unto him shall the gathering of the people be” (Genesis 49:10). Moses’ prophecy: “And this is the blessing of Judah: and he said, Hear, LORD, the voice of Judah, and bring him unto his people: let his hands be sufficient for him; and be thou an help to him from his enemies” (Deuteronomy 33:7). This tribe was known as an effective military tribe (Judges 1:2). Through its lineage came many key leaders in Israel (Isaiah, King David, Solomon, Amos, Habakkuk, Micah, Obadiah and Zephaniah). What end-time group of people will go out with military fervor, fully representing Christ to prepare the world for the Second Coming? I looked, and there before me was a white horse! Its rider held a bow, and he was given a crown, and he rode out as a conqueror bent on conquest (Revelation 6:2 – NIV). The tribe of Ephraim was represented as a calf or an ox. Perhaps no tribe symbolizes man’s struggle with God more than that tribe. Often rebuked, then praised, Ephraim was always under the watchful eye of God. That name would come to represent the entire northern kingdom of Israel. The only other use of this word in Revelation is in describing the color of the “dragon” or Satan (Revelation 12:3). Was Ephraim like Satan? Is there an end-time people who typify unyielding rebellion? Jacob noted this individual as the honored “first born,” though Manasseh should have been (Genesis 48:19-20). Moses noted that he would gore the nations of the earth with its ox horns (Deuteronomy 33:17). It was from this tribe that the great prophet Samuel was born (I Samuel 1). The Ephramites did not like King David’s rule and later his son Solomon’s reign. They were made subservient to the throne. Solomon heavily taxed the northern tribes. When Solomon died, those tribes, headed by the Ephramites, approached Solomon’s son Rehoboam to talk of their plight. The son had no sympathy and planned to tax them heavier. Jeroboam I, an Ephramite, was therefore made king of the northern ten tribes. This individual led Israel into apostasy as never seen before in their history. God reacted with a curse (I Kings 14:7-12), noting that evil would enter his house and over those he led. Finally, many were killed (Hosea 9:13) when the Assyrians captured their territory and took 27,000 people prisoner. God at last declared “Ephraim is joined to idols: let him alone” (Hosea 4:17) (755 B.C.). He then became more explicit: “O Israel, thou hast destroyed thyself; but in me is thine help” (Hosea 13:9) (725 B.C.). What end-time Christian “nation” will apostatize against God’s standards and have satanic characteristics, speaking like the dragon (Revelation 13:11) with blood on its hands? Rush Limbaugh even noted in April that the liberal left fears and hates Christians. Why? It is unable to dominate that group. But they love Pope Francis because he aligns with their thinking! Protestant America is rebelling against the very cause of its past success. Paralleling this was a Pew Research Center Study earlier this year (2015) that showed a sharp decline in Christianity in America. Rabbi Jonathan Cahn noted in 2015 that the world has entered what the apostle Paul called the “falling away,” which marks the beginning of the “end of the age” with Christ’s return shortly to follow (II Thessalonians 4:3). Because of the Supreme Court’s June 26 ruling on gay marriage, Cahn observed that the end of Christian America has begun. Obama bathed the Whitehouse in LGBT colors of the rainbow, as did the new trade towers in New York after that decision. The second horse’s red color also suggests fiery persecution and the shedding of blood. The “silence” of this country and its administration toward the hundreds of thousands of displaced Christians in the Middle East and the utter ineptness of stopping the carnage of ISIS portrays the people of the red horse. A sense of God’s love and His tender heart for committed Christians has disappeared from this country’s leaders. A growing number of case studies over the past five years show that America is actually becoming anti-Christian, even criminalizing moral convictions. President Barack Obama made an offensive remark against Christians at a prayer breakfast in February 2015. Disconcertingly, Pope Francis hinted at the same in his address to Congress September 23, 2015. Unexplained, in July of this year, President Obama detained 27 Chaldea Catholic individuals from coming into this country who had been forced to flee their homes by ISIS. He is not blocking thousands of Muslims from coming into the United States. Former Congressman Frank Wolf of Virginia said that this “current administration” has “inherent bias” against Christians. He also said that when the twenty-one Coptic Christians were beheaded in Egypt, President Obama called them “migrant workers,” denying that they were killed because of their Christianity. The same thing happened when 148 Kenyan Christians were executed by al-Shabaab. Adding to the administration’s defamatory and salacious moves came Obama’s public encouragement to promote gay rights (directly to the people of Kenya in a brief visit). President Uhuro Kenyatta forcefully objected. Christianity has been infected with relativism so much that its objectives are no longer to glorify God but to find social peace of mind and personal satisfaction. If living today, what would he say now? 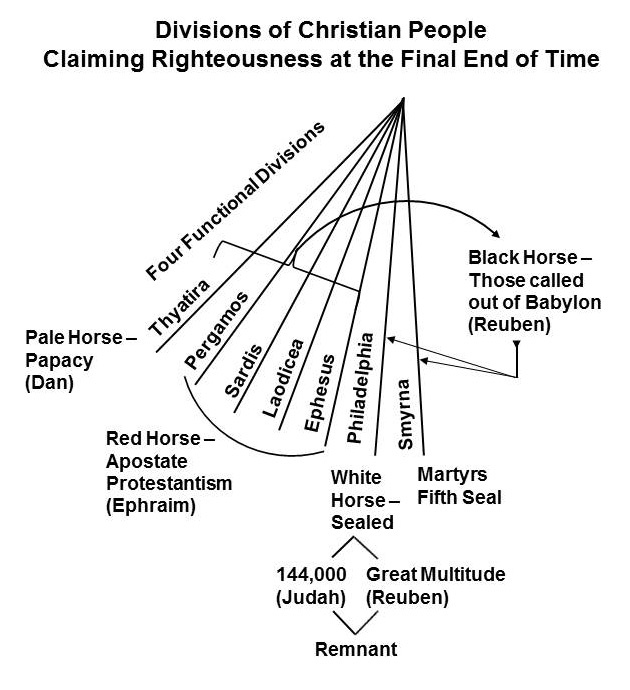 The end-time people symbolized by the red horse are Christians who have apostatized so deeply that their drive to undermine the truly faithful, the white horse people, leads to persecution. This is increasingly being seen within the United States and from the emerging “Christian Left.” Ephraim, under Jeroboam I, led the northern tribe into rebellion. It had a warring spirit against Judah – the remnant of God’s people. Ephraim is not listed among the 144,000 in Revelation 7:4-8. The third living creature (Revelation 4:7) had the face of a man, symbolizing the tribe of Reuben. He was the first-born but lost his birthright due to his adulterous affair with Bilhah, his father’s concubine (Genesis 35:22). The “spiritual descendants” of Reuben represent those associated with the prostitute Babylon (Revelation 17:1-7). But they will hear the call to come out of her (Revelation 18:2-4). They will be saved. How do we know? Reuben repented and is listed among the 144,000 in Revelation 7! The white horse people (Judah – lion – east) went out to “conquer” (Revelation 6:2). The red horse people (Ephraim – ox – west) went out to take peace from the earth. The black horse people (Reuben – man – south) showed no action waiting for that call. Reuben means “a son” – he remained in the family. The fourth “living creature” was like a flying eagle (an unclean bird – Deuteronomy) (Revelation 4:7) (the ensign of the tribe of Dan). This symbol was one of self-exaltation (Obadiah 4). Christ associated it with death and doom (Luke 17:35, 37). God’s throne was located on the sides of the north (Psalm 48:2; cf. Ezekiel 1:4). Lucifer vowed he would exalt his throne to the “mount of the congregation” in the sides of the north (implying to replace God’s sovereignty – Isaiah 14:13-14; cf. Jeremiah 6:22-23). What group of people might want to assume God’s role? “Opposeth and exalteth himself above all that is called God, or that is worshipped; so that he as God sitteth in the temple of God, showing himself that he is God” (II Thessalonians 2:4). This represents the antichrist in his final fervor against God and His people. The “pale horse” is noted with “death” and “hell” following it. Seal five will reveal that hatred and death. This group of people is represented by those who are drunk with the blood of the saints, and who are centered in the city of the seven hills (Revelation 17:6, 9). Dan was located to the north of the sanctuary. “At the commencement of the time of trouble, we were filled with the Holy Ghost [Latter Rain – Seven Spirits of Lamb – first seal] as we went forth and proclaimed the Sabbath more fully. This enraged the churches and nominal Adventists, as they could not refute the Sabbath truth. And at this time God’s chosen all saw clearly that we had the truth, and they came out [third Seal] and endured the persecution with us [second seal]. [But then she says] I saw the sword, famine, pestilence, and great confusion in the land [United States] [Matthew 24, Mark 13 and Luke 21 signs]. The wicked thought that we had brought the judgments upon them, and they rose up and took counsel to rid the earth of us [fourth and fifth seals], thinking that then the evil would be stayed.” – Early Writings, pp. 33-34 (emphasis added). 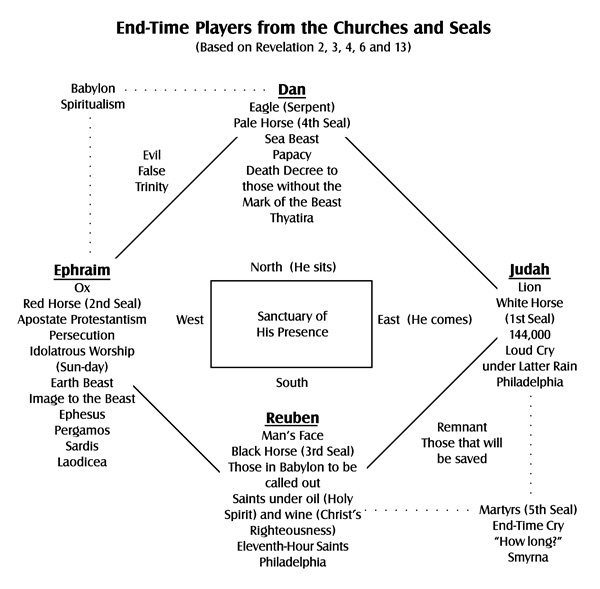 The fourth Seal is the planning and preparation for death to God’s people. The living creatures provide the keys to understand the Seals. They introduce us to the key players that will be described in the rest of the book of Revelation. They are one of God’s apocalyptic keys! Osborne, Grant R.; Revelation (Baker Book House; Grand Rapids, MI), p. 220. Beale, G. K.; The New International Greek Testament Commentary; The Book of Revelation (William B. Eerdmans Publishing Company, Grand Rapids, Michigan, 1999), p. 327. Osborne, op. cit., p. 231. Osborne, op. cit., p. 232. Thomas, Robert L.; Revelation 1–7 – An Exegetical Commentary, vol. I (Moody Press, Chicago – 1992), p. 355. Beale, op. cit., p. 330. Ford, J. Massingberde; The Anchor Bible (Doubleday, New York, 1975) p. 340. Keil, C. F. and Delitzsch, F.; A Commentary on the Old Testament (Hendrickson Publishers, Peabody, MA; 1866–1991), vol. 1, p. 660. Beale, op. cit., pp. 372-373. Gledhill, Ruth; Christianity Today, April 7, 2015. Ford, Desmond; Crises (Desmond Ford Publications, 1982), p. 391.